!! !PRICE NEGOTIABLE - PLEASE MESSAGE ME IF YOU ARE INTERESTED IN THIS DRESS!!! This elegant flowing silk and chiffon gown exudes ethereal grace, and has never been worn down the aisle. I purchased this gown and then I changed my mind and am wearing another design. Dress is unaltered. Near-perfect condition, there is a small amount of dirt on the hemline that can be removed with light dry cleaning. Rest of the gown in perfect condition, no tears or imperfections. The label size is 10, and I usually wear either a dress size 6 or 8, and it fits me well, a little on the looser side around the bust. Can be worn with or without the straps. Straps can be tucked in for versatility or removed entirely. There's something magical about Tara in silk chiffon. The romance when she moves. Her beautiful, thoughtfully draped sweetheart bodice. 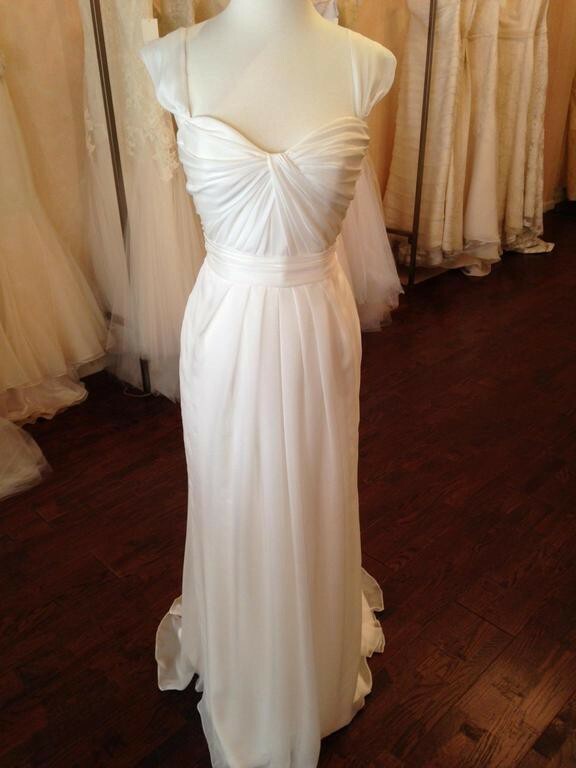 Her gentle, flowing sash and effortless pleated sheath silhouette. Her femininity and ethereal layers of sheer silk chiffon evoke kindness and love. Perhaps one can sense the love that goes into making this gown by hand, one by one in our San Francisco studio. Draped with shape to showcase your curves and frame your gorgeous waistline. Inspired by Kuan Yin, or Tara, the Goddess of Compassion. "She who hears the cries of the world." Once you send a message, Margaret can invite you to purchase the dress.